Located in the heart of downtown, your guests will enjoy exquisite comfort and convenience in 366 luxurious rooms, including six suites. Complete business services are available including fax, copying, packaging and shipping. A dramatic atrium lobby is the ideal gathering place for shopping at Civic Center Shops and Victorian Square, all connected to Hyatt by glass skywalks. Your guests will discover a full range of diversions from casual dining in Blue Fire Restaurant for breakfast, lunch and dinner to cocktails in The Lobby Bar. Other amenities include a heated, indoor pool attached to a sundeck and a newly-renovated fitness center. We are minutes away from golf and tennis facilities, Keeneland Race Course and Red Mile harness track. We are 2 miles away from the University of Kentucky and 10 minutes from Bluegrass Airport via complimentary transportation. Lobby Bar: From University of Kentucky Basketball, to concerts and special events, the Lobby Bar has been the traditional gathering place for more than 20 years. Perfect for get-togethers or casual meetings. Serving Kentucky Bourbons, specialty drinks, wine and beer along with appetizers and sandwiches. Saul Good: Semi-Casual sit-down dining. Menu includes a wide variety of meals from Steak to Hotbrowns. Entrees range from $10.00-$25.00. 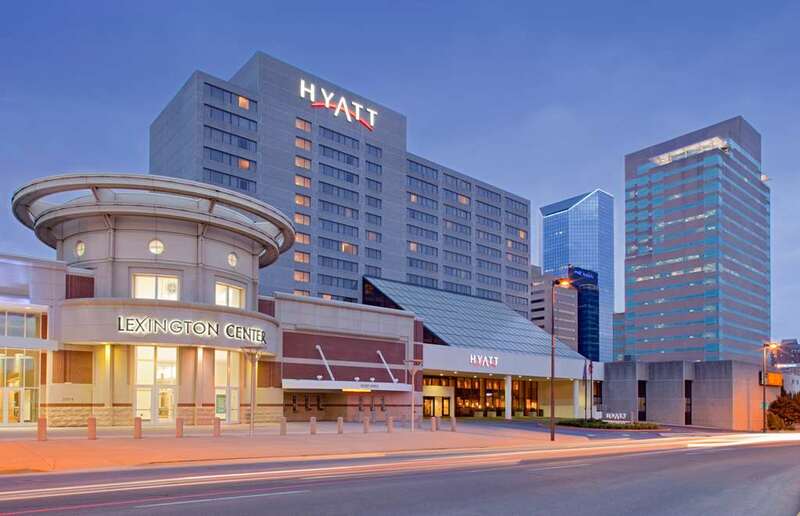 The Hyatt Regency is located in the heart of downtown Lexington. The hotel is part of a complex which connects us to the new Lexington Convention Center, Civic Center Shops and Rupp Arena. We are 2 miles from the University of Kentucky and 10 minutes from the Bluegrass Airport. A prime location which is also convenient to golf and tennis facilities, as well as world-renowned horse racing at Keeneland and the Red Mile.